This adult was observed in the Goldfield Mountains, Maricopa County, Arizona, USA on 11 Oct. 2008. The stipules are paired structures on the stem where the leaf petiole is attached; visible just to the right of the insect. 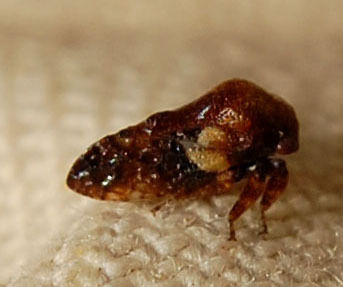 Tree hoppers have two main strategies for survival. One is to look so much like their host plant that insectivorous birds and lizards overlook them. The second is to establish relationships with ants by offering them sugary honey dew in exchange for protection. This species is a specialist on Creosote Bush (Larrea tridentata) where it resembles to a great degree the brownish-red stipules. Creosote bush has apparently only been a member of the southwestern United States flora for some 11 to 15,000 years. The question is did this hopper arrive with creosote bush when it was first established - from Argentina - or is it an insect species that also occurs on related plants in the Sonoran Desert? This species was also found on Creosote Bush in the Goldfield Mountains, Maricopa County, Arizona, USA on 11 Oct. 2008. 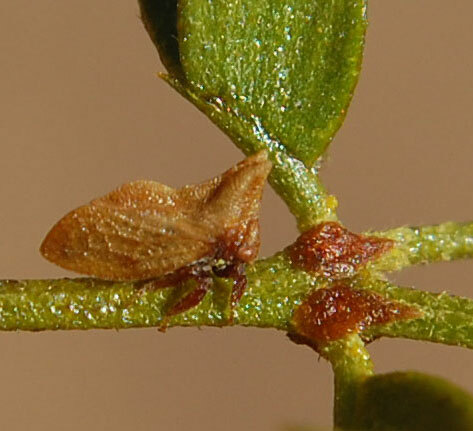 This species, a relative of the above, is also a specialist on Creosote Bush (Larrea tridentata). The pronotum is the structure on the top of the insect just behind the head. In tree hoppers the pronotum is greatly enlarged and takes on sometimes fantastical forms. Indeed this pronotal structure is the major contributor to the disguises that many tree hoppers have. The tree hoppers on creosote bush are closely related and it seems that evolution has quickly produced these varied species on this abundant host. The three known species apparently divide the creosote bush habitat in time and space, i.e. they mature during different seasons and may focus their feeding activity in different microhabitats upon the plant. The color and structure of the pronotum may resemble their preferred feeding spots - this needs to be verified through more detailed field observations.